Lisa Battle is an artist who creates a distinctive style of abstract sculptures by handbuilding with stoneware clay. She explores form and line in three-dimensional space, inspired by patterns created in nature through wind and water erosion, and the graceful arching movements of dance. As a viewer moves around the work, the lines advance and recede, giving an undulating sense of movement. The subtle surface treatments of her work are derived from atmospheric firing techniques, including wood firing in a multi-chambered Noborigama kiln and pit firing. Lisa began working with clay about 13 years ago after completing a masters’ degree in psychology. Her sculptures have been shown in juried exhibitions in the Washington, DC and New York metro areas, including several shows at the Brooklyn Waterfront Artists’ Coalition, juried by curators from The Metropolitan Museum of Art and MoMA. Lisa lives and works in Maryland, where she is a member of the wood fire community at Monocacy River pottery near Frederick, Maryland. 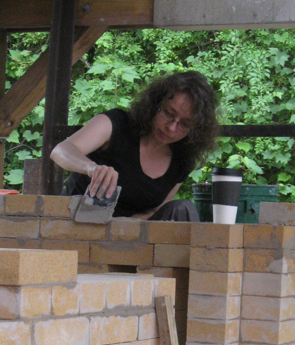 She is a former trustee of the Baltimore Clayworks, a resident artist at The Clay Co-op in Rockville, Maryland, and a member of the board of the Washington Sculptors’ Group.